Nagpur, Metro Rail News: The wait for commuting through Nagpur in Metro rail is fast appearing to be over as the trucks loaded with metro rail coaches arrived in Nagpur on Tuesday morning. The consignment was accorded a warming welcome as the Rotary Club members attired in whites with orange turban received the much awaited ‘delivery’. The members in traditional Maharashtrian costumes performed cultral Lejhim dance before the trucks. 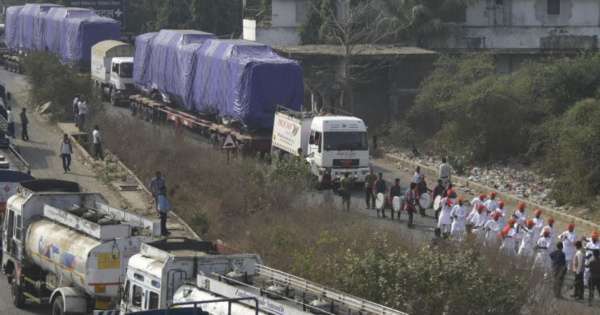 The three coaches arrived at Mihan flyover on Wardha road at 9.30 am on Tuesday morning. Sources informed that soon the coaches would be put up on tracks for trial run.